Of course finance is important. Cash flow is the life blood of any business, and chasing payment (ultimately, not getting paid) is a pain in the… assets. 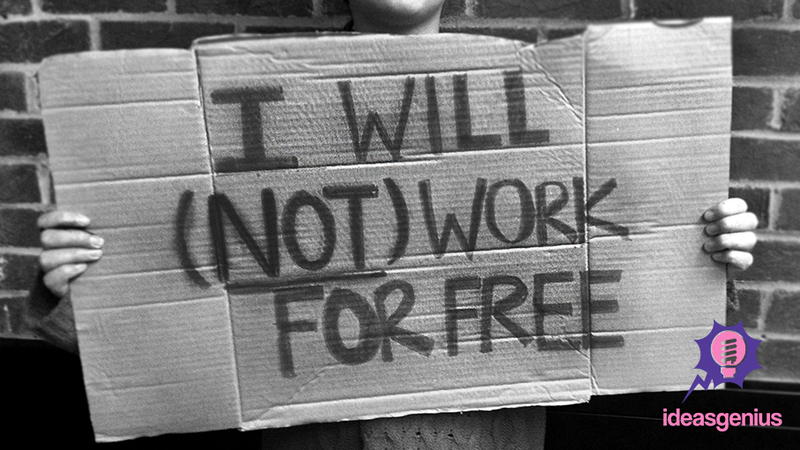 However a lot of entrepreneurs say you have to be willing to work for free or next to nothing when you’re starting a business. So what do you do when you find yourself in that situation where you’re doing work without getting paid? Even if you are working speculatively, you’re committing your valuable time and expertise which is worth something. We think you could consider the following 3 ways of getting the best from the situation. 1. Ask for expenses. Your full fee may not be available – either because you haven’t yet proven your business to ask for your full fee, or the client needs your services and products but has a limited budget. Often a request for expenses (travel, consumables, legal or research costs) will be honoured if you can make a fair case for it. For example, if you have to travel from London to Birmingham to speak at a conference, you can ask for train fare to be covered. In our experience, a fraction of the bill is met more favourably than the whole fee. 2. Ask for testimonials. Obviously your clients sees the value of your work. If they didn’t, they would not have asked you to be part of their project. Providing you with a testimonial is like giving a recommendation to future clients. You can ask for a testimonial in a number of ways; either as an email request at the end of your work or with a feedback form (less formal). Whichever way you ask for it, getting that testimonial will help you get more work in the future. 3. Ask to document your involvement. Depending on your business, you might be able to photograph, film or in some other way capture your role or your work for your website, showreel or portfolio. For instance, if there is an important or well-known person involved, you could be filmed or photographed with them. If that is not your preferred style, why not suggest a ‘day in the life’ article for your local newspaper or industry related blog. Using it on your own website will give potential clients a better idea of how you work… more importantly, what you’re worth. However you do it, getting some credit back for what you do is important to sustain your business. While you’re working for someone else, you’re still working and there has to be some benefit to your business. The best case scenario when working with no money is to agree all three of the above with your client. This can be done at the point that they tell you they are unable to pay your costs. Then confirm it in writing and make sure you stick to it… for your own benefit.